A player of incredible drive and committment, and no shortage of talent, Mick O'Driscoll is one of the most respected forwards in Irish rugby. O'Driscoll made his provincial debut for Munster in 1998 and quickly became a regular. International honours followed three years later when he was brought on as a replacement in the summer clash with Romania in Bucharest. 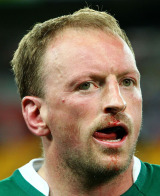 O'Driscoll also featured as a replacement in the November international against Fiji the following year. However, he would have to wait a further two years for his next cap because he joined French outfit Perpignan in the summer of 2003. Despite being a lock by trade, O'Driscoll was often used in the back row during his time in France, giving him a versatility which not only strengthened his game but also boosted his international ambitions upon his return to Munster in 2005. Although often forced to play second fiddle to Paul O'Connell and Donncha O'Callaghan at provincial level, he featured in eight of Munster's nine matches during their successful Heineken Cup campaign of 2005-2006. O'Driscoll was then afforded his first start for Ireland in the 2007 Six Nations clash with Italy in Rome. He remained on the fringes of the squad for the next few seasons while continuing to prove an extremely valuable member of the Munster squad, playing his part in their second Heineken Cup triumph in 2008. He proved even more influential the following year, captaining the province in their narrow defeat by the All Blacks before missing just one game as Munster claimed the Magners League title. O'Driscoll only seemed to improve with age and after winning Munster's player of the year for 2009-2010, he was repeatedly called upon by Ireland boss Declan Kidney to deputise for the injured O'Connell. Upon O'Connell's return, he lost his place in the Ireland starting line-up for the 2011 Six Nations but remains a valuable member of the Irish squad.